After the severance of diplomatic relations between Washington and Taipei in January 1979, the future supply of military equipment for Taiwan's armed forces was in question. Thanks to the enactment of the the Taiwan Relations Act (TRA) in early 1979, Taiwan was able to purchase advanced weapons and military equipment from the US. 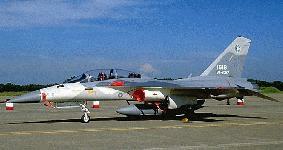 Taiwan built nearly 300 Northrop F-5s under license from 1974 to 1986. 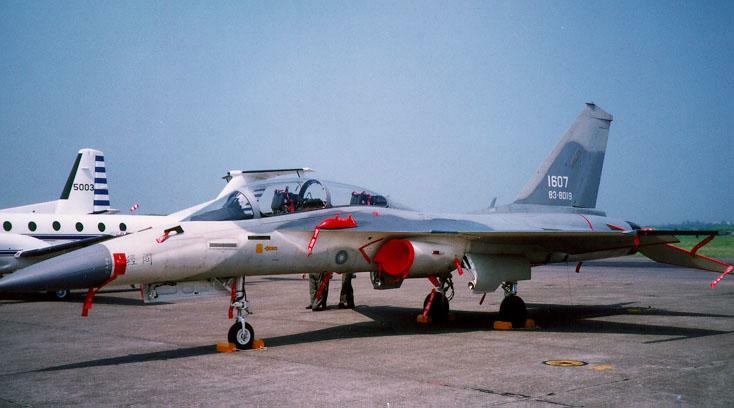 From the early 1980's, Taiwan expressed an interest in purchasing US fighter aircraft to replace its obsolescent Northrop F-5 and Lockheed F-104 fighters. The United States, which was interested in improving relations with China, denied Taiwan's request to purchase the more capable F-16, and blocked a subsequnetly proposed $1 billion sale of 100 F-20 Tigersharks in July 1982. The 1982 decision by the Reagan administration to bar export of new fighters to Taiwan left technical assistance unrestricted. Taiwan decided to go it alone to build the Indigenous Defense Fighter (IDF). Taiwan produced the Ching-kuo Indigenous Defense Fighter with extensive assistance by American corporations, led by General Dynamics. The project consisted of four sub-projects. They were the Ying-yang project (in cooperation with General Dynamics Corporation) which made the air-frame; the Yun-han project (in cooperation with Hughes Corporation), which designed the engine; the Tian-lei project (in cooperation with Westinghouse Company), which took care of the avionics system; and the Tian-chien project, which developed the weapons system. The twin-engine IDF is similar to the F-16 except that it is slightly smaller and has a slightly shorter range. The IDF is a hybrid as far as its external appearance is concerned. 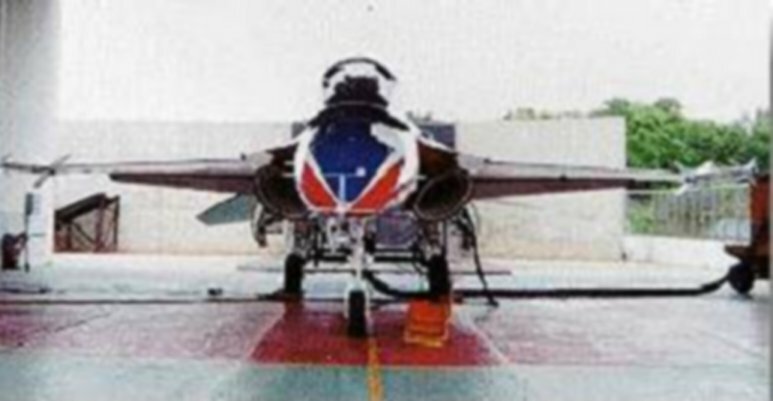 The nose of the fighter jet is a replica of the F-20A Tigershark, while ts body, wings, and vertical tail surface are apparently lifted from the F-16, and the shape of its cockpit hood and vertical tail wing and its girth near the engine inlets have a notable French flavor. The IDF is superior to the F-5E in airborne performance. The IDF accelerates better than the F-104 and its turning radius is smaller than that of the F-5. The aircraft, equipped with four Sidewinder missiles, but without spare fuel tanks, has a combat endurance of three minutes on afterburner and a combat radius of between 70 and 90 nautical miles. With a combat radius of 600 nautical miles while carrying out armed reconnaissance and patrol missions, the IDF is capable of conducting preemptive raids and strikes at airports along the Chinese coast. It is mainly used in combat for air control and is capable of using "Hsiung Feng"-II missiles to attack targets at sea. 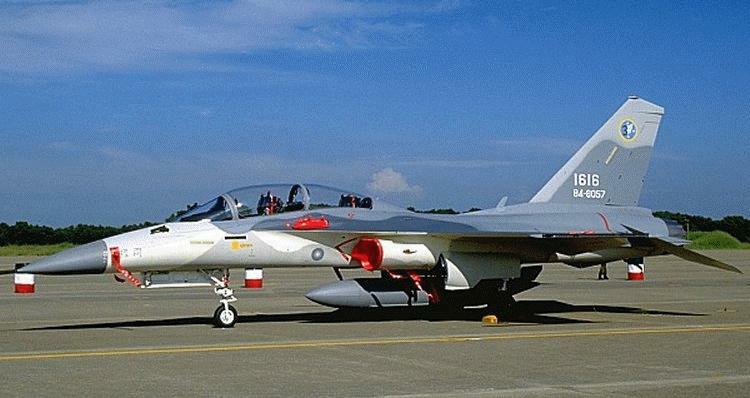 Most of the IDFs are expected to be armed with the indigenously-produced, BVR Tien Chien-II (Sky Sword-II) ARAAM. It is equipped with a GD-53 radar, which evolved from the APG-67 and is essentially similar to it in performance. The APG-67 radar uses pulse Doppler technology at X-band and has 15 operational modes in all, eight air-to-air and seven air-to-ground. It can also operate at three different pulse repetition frequencies [PRF]--high, medium, and low--depending on whether the plane is looking up, looking down, or involved in a dogfight in the air, respectively. 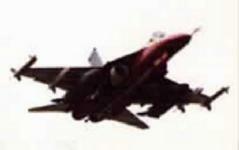 In a look-down mode, the plane has an effective scanning range of 39 kilometers; looking up, 57 kilometers. The eight air-to-air modes are as follows: searching and range finding while looking down, searching and range finding while looking up, speed searching, tracking (10 targets) and scanning simultaneously, dogfight, tracking a single target, surveying the situation, and continuous-wave indicator interfacing. The seven air-to-ground modes are as follows: real wave velocity topography, Doppler wave velocity sharpening, air-to-ground range finding, moving surface target indicating, freezing, and searching for target at sea surface. 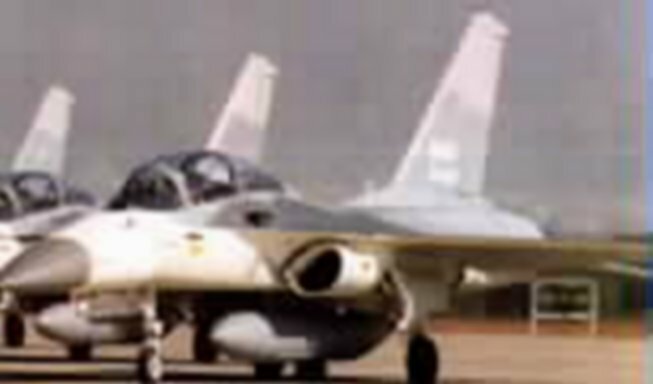 In April 1997 Litton's Applied Technology division was awarded a production contract and options totaling $116.2 million by the Aerospace Industrial Development Corporation of Taiwan, ROC, for Improved Radar Warning Receivers (IRWR) to be installed aboard the Indigenous Defense Fighter. Despite its compact and light external design, the IDF is fitted with two large engines short on propulsive force. The fatal weakness of the IDF is inadequate engine propulsion, and its excess body weight has made the plane accident-prone. 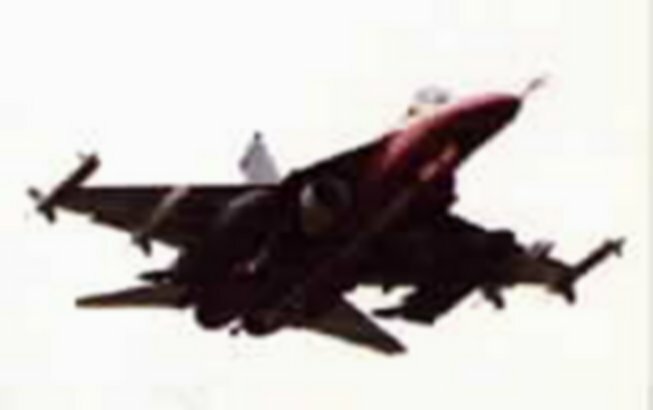 Initial versions of the IDF have a top speed of Mach 1.2, using an engine jointly produced by Taiwan and Allied Signal Garret Engine Division. The TFE1042-70 engine was designed for lightweight fighter/attack applications to provide improved aircraft performance and reduced life-cycle costs. The first production TFE1042-70 engine was delivered to Taiwan in 1992, and since then ITEC has delivered more than 300 production engines for the IDF. The International Turbine Engine Corporation (ITEC) operates through a joint venture between AlliedSignal Engines and the Aero Industrial Development Corp. of the Republic of China. The plan to replace its existing engine with a more powerful one was scrapped because of the commissioning of the F-16 and Mirage 2000. 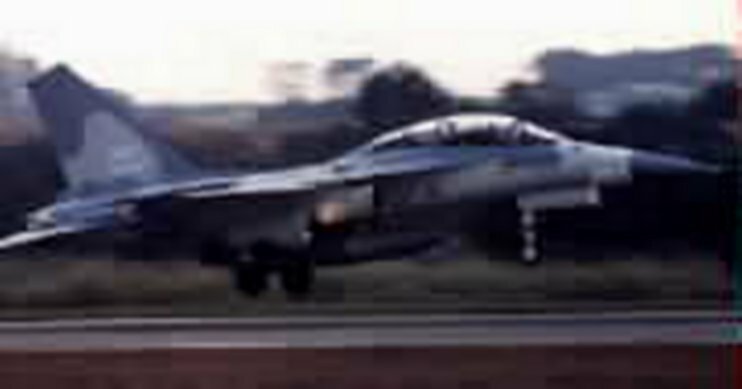 A higher thrust version of the engine would be incorporated into a more capable successor designated the Advanced Defensive Fighter. Manufacture of the initially planned 250 IDFs was initially estimated at $4.2 billion with a unit cost between $25 and $30 million. At least $1 billion was invested in propulsion and avionics. The IDF is manufactured and assembled in Taichung, which is the manufacturing center of Taiwan's aerospace industry. The Aerospace Industrial Development Corporation is Taiwan's leading manufacturer of military aircraft, including the IDF. With a work force of 6000 employees, AIDC was established in 1969 under the Ministry of Defense as the Aero Industry Development Center (AIDC). The AT-3 advanced trainer, a twin-turbofan aircraft, was designed, developed and produced by the AIDC. In cooperation with Bell Helicopter Inc., it has produced the UH-1H helicopter. Joining forces with the Northrop Corporation, it jointly produced the F-5E/F fighter plane. The T-53 engine was built in cooperation with Textron Lycoming Inc., while both the TFE731 and TFE1042 engines were jointly manufactured with the Allied Signal Aerospace Company. The organization was renamed Aerospace Industrial Development Corporation effective 01 July 1996, when it was moved under the aegis of the Ministry of Economic Affairs. The change of the overseeing agency is seen as a step in the direction of privatization by the year 2000. The Taiwan Aerospace Corporation (TAC) is a private company in which the government holds a 29 percent stake. TAC provides several parts for the IDF, including frames and bulk-heads. The IDF has faced numerous developmental and operational problems since its inception in the 1980s. Nevertheless, its technical sophistication, with its fly-by-wire controls and blended wing-body design, is believed to be superior to any aircraft produced and deployed by China to date. By 1997 some 60 had been built, and production of all 130 IDFs is scheduled to be completed by early 2000. 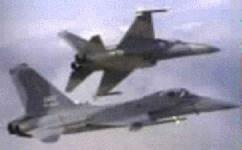 The ROC Air Force cut its order of 250 IDFs to 130 after September 1991, in the wake of jet-fighter deals with the United States and France. Taiwan remaining requirements were partially filled when the Bush Administration agreed to sell 150 F-16's, a decision made with an understanding that Taiwan already possessed the capability of producing advanced fighters. For the remaining shortfall Taiwan ordered 60 Mirage 2000 fighters from France. 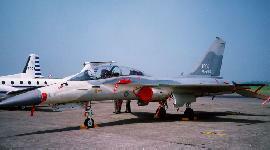 Taiwan purchased 120 single-seat F-16A models and 30 two- seat F-16B models. On-island deliveries, which began in April 1997, were scheduled for completiong by the end of 1999. These aircraft are armed with upgraded AIM-7M/SPARROW SAR and AIM-9P4 and AIM-9S SIDEWINDER IR AAMs. Deliveries of 60 French-built Mirage 2000-5s also began in April 1997 and were completed by October 1998. With its four MICA active radar (AR) and two MAGIC II infrared (IR) AAMs, the Mirage 2000-5 is Taiwan's most formidable air defense fighter. The first squadron of IDFs joined the ROC Air Force in December 1994, with each carrying a price tag of US$24 million. 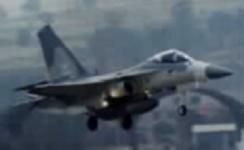 As of early December 1994, 32 IDF fighter planes were stationed at Ching-chuan-kang Air Force Base. After the delivery of the 130th IDF by the end of 1999 the IDF assembly line will be shut down. ROC AIR FORCE TAKES DELIVERY OF LAST IDF FIGHTER (CNA-Taiwan) 14 January 2000 -- The ROC Air Force took delivery of the last of 130 locally developed defense fighters on Friday. The military has formed two IDF wings which are deployed at the Taichung and Tainan air bases. LAST LOCALLY-DEVELOPED IDF FIGHTER ROLLS OFF ASSEMBLY LINE [CNA Taiwan] 13 January 2000 -- The 130th and last of the locally developed Ching-kuo Indigenous Defense Fighters (IDFs) will be delivered to the Republic of China Air Force on Friday. Foreign Military Sale, Spare Parts for TECRO July 30, 1999 -- The Department of Defense announced today the possible sale to the Taipei Economic and Cultural Representative Office (TECRO) in the United States of a Cooperative Logistics Supply Support Arrangement (CLSSA) for spare parts in support of F-5E/F, C-130H, Indigenous Defense Fighter, F-16A/B with Block 15 Mid-Life Upgrade.